shentongroup is a stronger company, with a more complete service offering and a greater share of the continuous power market than 4 years ago. In part to thank for this is Stewart Timony, who joined shentongroup in September 2014 and demonstrated sheer dedication to his colleagues and to shentongroup customers throughout his time here. 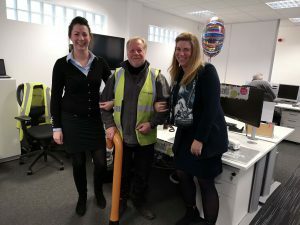 As he retires this month, he leaves behind him a legacy of hard work and commitment and he’ll definitely be sorely missed by his shentongroup co-workers and clients. Stewart joined shentongroup as Technical Support in our Power Care maintenance and support department and then made the transition into our Generator rental department. 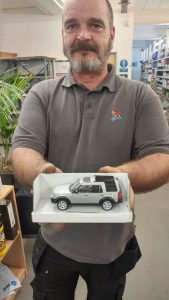 Speaking on Stewart’s valued roles here, shentongroup Operations Manager (Generators and UPS), Lorraine John commented: “Stewart was a highly regarded member of the team who was always willing to help at any time of day and night. His industry knowledge was extremely valuable to both his peers and our clients. He will be missed by all and we wish him well in his retirement”. Stewart has obviously left a lasting impression on the team he leaves behind. 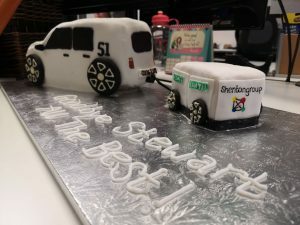 As you can see in an accompanying image, one grateful colleague even went so far as to mark Stewart’s retirement by making him a cake in the shape of the numbered vehicle and trailer he used whilst working for shentongroup’s rental division. Another colleague took the time to construct a model for him to remember us by. From the entire shentongroup team, Stewart, thank you for paving the way forward and may we all wish you a very, very enjoyable retirement in sunny Spain!